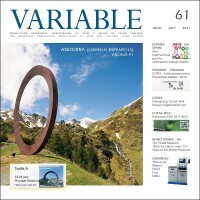 VARIABLE (2006 - 2018) - Numbers 1 to 50 The quarterly publication of ATEEME specializing in ATMs and variable value stamps. Size: 21 x 21 cm. - 36 to 50 pages - Color - Spanish & English edition. Pack with the 50 quarterly publications edited from 2006 until the end of 2018, including the issues which are sold out! VARIABLE 31 - January 2014 The quarterly publication of ATEEME specializing in ATMs and variable value stamps. Size: 21 x 21 cm. - 42 pages - Color - Spanish & English edition. (IMPORTANT. The price includes the shipping by economy mail as a printed matter, once each three months. For other shipping options, please contact us). VARIABLE 32 - April 2014 The quarterly publication of ATEEME specializing in ATMs and variable value stamps. Size: 21 x 21 cm. - 46 pages - Color - Spanish & English edition. (IMPORTANT. The price includes the shipping by economy mail as a printed matter, once each three months. For other shipping options, please contact us). VARIABLE 33 - July 2014 The quarterly publication of ATEEME specializing in ATMs and variable value stamps. Size: 21 x 21 cm. - 50 pages - Color - Spanish & English edition. (IMPORTANT. The price includes the shipping by economy mail as a printed matter, once each three months. For other shipping options, please contact us). VARIABLE 34 - October 2014 The quarterly publication of ATEEME specializing in ATMs and variable value stamps. Size: 21 x 21 cm. - 48 pages - Color - Spanish & English edition. (IMPORTANT. The price includes the shipping by economy mail as a printed matter, once each three months. For other shipping options, please contact us). VARIABLE 35 - January 2015 The quarterly publication of ATEEME specializing in ATMs and variable value stamps. Size: 21 x 21 cm. - 56 pages - Color - Spanish & English edition. (IMPORTANT. The price includes the shipping by economy mail as a printed matter each three months, along with other publications. For other shipping options, please contact us). VARIABLE 36 - April 2015 The quarterly publication of ATEEME specializing in ATMs and variable value stamps. Size: 21 x 21 cm. - 38 pages - Color - Spanish & English edition. (IMPORTANT. The price includes the shipping by economy mail as a printed matter, once each three months. For other shipping options, please contact us). VARIABLE 37 - July 2015 The quarterly publication of ATEEME specializing in ATMs and variable value stamps. Size: 21 x 21 cm. - 54 pages - Color - Spanish & English edition. (IMPORTANT. The price includes the shipping by economy mail as a printed matter, once each three months. For other shipping options, please contact us). VARIABLE 38 - October 2015 The quarterly publication of ATEEME specializing in ATMs and variable value stamps. Size: 21 x 21 cm. - 58 pages - Color - Spanish & English edition. (IMPORTANT. The price includes the shipping by economy mail as a printed matter, once each three months. For other shipping options, please contact us). VARIABLE 39 - January 2016 The quarterly publication of ATEEME specializing in ATMs and variable value stamps. Size: 21 x 21 cm. - 60 pages - Color - Spanish & English edition. (IMPORTANT. The price includes the shipping by economy mail as a printed matter, once each three months. For other shipping options, please contact us). VARIABLE 40 - April 2016 The quarterly publication of ATEEME specializing in ATMs and variable value stamps. Size: 21 x 21 cm. - 50 pages - Color - Spanish & English edition. (IMPORTANT. The price includes the shipping by economy mail as a printed matter each three months, along with other publications. For other shipping options, please contact us). VARIABLE 41 - July 2016 The quarterly publication of ATEEME specializing in ATMs and variable value stamps. Size: 21 x 21 cm. - 50 pages - Color - Spanish & English edition. (IMPORTANT. The price includes the shipping by economy mail as a printed matter each three months, along with other publications. For other shipping options, please contact us). VARIABLE 42 - October 2016 The quarterly publication of ATEEME specializing in ATMs and variable value stamps. Size: 21 x 21 cm. - 54 pages - Color - Spanish & English edition. (IMPORTANT. The price includes the shipping by economy mail as a printed matter each three months, along with other publications. For other shipping options, please contact us). VARIABLE 43 - January 2017 The quarterly publication of ATEEME specializing in ATMs and variable value stamps. Size: 21 x 21 cm. - 62 pages - Color - Spanish & English edition. (IMPORTANT. The price includes the shipping by economy mail as a printed matter, once each three months. For other shipping options, please contact us). VARIABLE 44 - April 2017 The quarterly publication of ATEEME specializing in ATMs and variable value stamps. Size: 21 x 21 cm. - 62 pages - Color - Spanish & English edition. (IMPORTANT. The price includes the shipping by economy mail as a printed matter, once each three months. For other shipping options, please contact us). VARIABLE 45 - July 2017 The quarterly publication of ATEEME specializing in ATMs and variable value stamps. Size: 21 x 21 cm. - 58 pages - Color - Spanish & English edition. (IMPORTANT. The price includes the shipping by economy mail as a printed matter, once each three months. For other shipping options, please contact us). VARIABLE 46 - October 2017 The quarterly publication of ATEEME specializing in ATMs and variable value stamps. Size: 21 x 21 cm. - 54 pages - Color - Spanish & English edition. (IMPORTANT. The price includes the shipping by economy mail as a printed matter, once each three months. For other shipping options, please contact us). VARIABLE 47 - January 2018 The quarterly publication of ATEEME specializing in ATMs and variable value stamps. Size: 21 x 21 cm. - 54 pages - Color - Spanish & English edition. (IMPORTANT. The price includes the shipping by economy mail as a printed matter, once each three months. For other shipping options, please contact us). VARIABLE 48 - April 2018 The quarterly publication of ATEEME specializing in ATMs and variable value stamps. Size: 21 x 21 cm. - 56 pages - Color - Spanish & English edition. (IMPORTANT. The price includes the shipping by economy mail as a printed matter, once each three months. For other shipping options, please contact us). VARIABLE 49 - July 2018 The quarterly publication of ATEEME specializing in ATMs and variable value stamps. Size: 21 x 21 cm. - 52 pages - Color - Spanish & English edition. (IMPORTANT. The price includes the shipping by economy mail as a printed matter, once each three months. For other shipping options, please contact us). VARIABLE 50 - October 2018 The quarterly publication of ATEEME specializing in ATMs and variable value stamps. Size: 21 x 21 cm. - 50 pages - Color - Spanish & English edition. (IMPORTANT. The price includes the shipping by economy mail as a printed matter, once each three months. For other shipping options, please contact us).